A reprint of George H. Budke's article from the 1940 edition of the Rockland Record. William Doherty and Marianne Leese have continued to dig up information about the diarist Minnie Torkler, featured in our previous issue. Nyack Sketch Log: An Artist and Writer Explores the History of a Hudson River Village, by Bill Batson, is reviewed by Winston Perry. Anthony Man, Marianne Leese and Erin Martin remember a talented man of principle and spirit, who did a great deal for the Historical Society. COVER PICTURE. 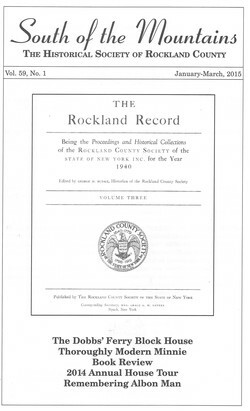 Title page of volume 3, the final volume of the Rockland Record, the journal of the Rockland County Society, where Budke's article about the block house in Palisades appeared. From the Collections of the Historical Society of Rockland County. In November 2014, after Albon Man passed, I penned a combined essay on this humble fellow and on Jean Gardner, long a Nyack historian. It follows: TWO AMONG THE LARGELY UNSUNG November 3, 2014 By Arthur H. Gunther III Many personalities and almost that number in characters passed through my Editorial Page desk at the old Journal-News in Nyack, N.Y., 1978-2006. Like a farmer pleased with a bumper crop, I was always provided with a fertile field of human emotion, accomplishment, sadness and elation for commentary. To a man, to a woman, to a child, all these people?s stories made you feel humble, for the tales of the human world are life itself, no matter the age, place or time. So many unknown among us achieve without notice. So many suffer from this ailment or weight upon shoulders but get the job done. And so many do good, paying their own relative fortunes of whatever sort forward. Their stories are largely left untold. Editorial pages, which may soon no longer exist, the victims of cost management in the shrinking print media, traditionally have heralded the extraordinary who die in office, who have served the people. But the journalist writing those pieces, him(her)self usually a bit jaded by the hoi polloi and more attuned to the common folk, really chew better on testimonials for the ordinary achiever whose praise would otherwise be unsung. And, so, we come this day to two such people, presented here in appreciation and respect, not on an editorial page but at least in words. While both were Rockland County, N.Y., people upon death, each could have lived anywhere in the world for their kind are in every community. My first person of note is Albon Platt Man IV of Palisades, a community volunteer and peace activist for most of his 95 years. Albon was a most articulate fellow, precise in speech and manner, and a stickler for correct grammar and word usage. Yet his kindly ways nudged his criticism rather than applying it hammer-like. He spent a total of 45 years in two publishing and editing jobs. He was a local historian who helped publish books for the Historical Society of Rockland. He volunteered in many community ways, including at a home for the developmentally disabled. Admiration for Albon Man comes easily, but for me it is anchored by his sacrifice for his beliefs. As a young man and then as a retiree, he opposed war, and he walked the talk by serving three years in prison for refusing induction into the U.S. Army. When I was asked by the Historical Society to collect 100 of my newspaper essays and Albon and the late Associated Press writer Jules Loh edited them into a book, Albon asked me which was my favorite. ?A fraternity of life and death,? I said, which was commentary on the World War II film, ?Saving Private Ryan.? Though a pacifist, Albon, a man of dignity and great empathy, also understood ?the fraternity of battle death,? of brothers in war but beyond it. In a way, I was talking about the ultimate peace. Albon knew. It is both the warrior and the peace-maker who can end all war and instead concentrate on the good the world can offer. Albon Man contributed much in his own ways. I have rarely met such a principled, selfless person. My second person of note is Jean Kathleen Sammes Gardner, a longtime Nyack resident who was born in Tunbridge Wells, Kent, England (what a wonderfully sounding location). ?Top girl? at Reigate County School, Jean volunteered in the London Civil Defense Corps, helping manage underground subway stations filled with residents during the Nazi ?Blitz? bombings. Later she was in the British Women?s Auxiliary Air Force where she was a radar reader in top-secret work. She met her husband, Harvey C. Gardner, an American, and moved to Nyack in 1953. Jean was an ardent community activist, fighting particularly for Rockland parkland and the Hudson River. Our paths met at a stop sign of sorts in the later 1990s when I editorialized that Nyack might remove some of the large oak trees in upper Memorial Park so that the Hudson could be better seen and more directly linked to the village proper. Jean, in a reply worthy of Winston Churchill?s bulldog stance against the Axis, quickly set me right. The trees had been there since just after World War I, when they were planted, each one of them, in memory of the men fallen in that ?War to End All Wars.? I felt humbled. I felt ashamed. I vowed to research better. And I still stand up straight when I hear Jean Gardner?s name, as if a schoolboy chastened in proper fashion. What gifts we have on this earth when we meet such people as Albon Man and Jean Gardner. The writer is a retired newspaperman who can be reached via ahgunther@yahoo.com This essay may be reproduced.